I have worked at the practice since 2007 starting as a student and qualifying with a Foundation Degree in Veterinary Nursing in 2010. 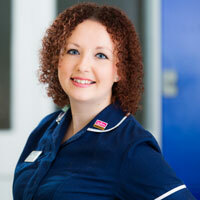 Being a Clinical Coach I enjoy helping student nurses with their training. My main interest is nursing feline patients as I have completed the ISFM Diploma in Feline Friendly Nursing. In my spare time I care for my many pets including 3 dogs, 3 cats and guinea pigs and I play the tenor horn in a brass band.